Summer conditions of intense sunlight , dry air and heat make August the most dangerous month for car tires, according to the Automobile Club of Southern California, which changes more tires for its members during August than in any other month. The Auto Club’s roadside assistance service responded to 53,680 tire-related calls in Southern California last August, a number that has consistently been in the 50,000-plus range over the past few years, according to the Auto Club Automotive Research Center’s Chief Automotive Engineer Steve Mazor. “Ultraviolet rays from the sun, combined with under-inflated tires, lead to blowouts and tire tread separation,” said Mazor. 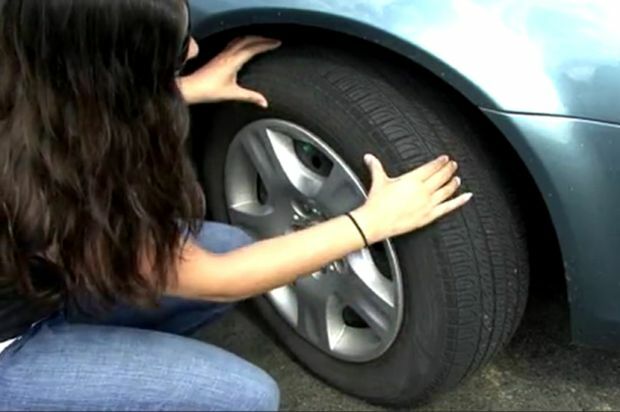 Vehicle handling can be adversely affected by improperly inflated tires. Under-inflated tires which run hot due to more friction with the road create an increased likelihood of tire failure and a possible crash. Over-inflated tires can have uneven wear, tricky handling and are more susceptible to road hazard damage and punctures. Motorists can avoid an unpleasant visit to the freeway shoulder or worse by checking their vehicle’s tires and the tire pressure, Mazor added. The National Highway Traffic Safety Administration (NHTSA) estimates that under-inflated tires are a factor in 195 fatalities annually and that tire failure causes approximately 11,000 crashes per year. The most common cause of failure includes tread separations, blowouts, bald tires and under-inflated tires. Properly maintained tires improve the steering, stopping, traction and load carrying capability of vehicles and can improve gas mileage by 3.3 percent. Additional tire industry research by the Rubber Manufacturer’s Association shows that 69 percent of vehicles on roadways are driven with one or more substantially under-inflated tire. Moreover, only 9 percent of vehicles are riding on four properly inflated tires. The Auto Club recommends that motorists regularly check tires when cool for uneven or excessive tread wear as well as proper inflation. The correct PSI (pounds per square inch of air pressure) for tires is located on the vehicle’s tire information label (on the vehicle’s doorjamb, fuel filler flap or glove box for original equipment specifications) – not the tire sidewall. If you have replacement tires, contact the tire manufacturer for proper inflation. California and many other states have minimum tread depth laws. Passenger cars shouldn’t operate on tires below 2/32” tread depth. If you need to purchase new tires, be sure replacements meet manufacturers speed/load specifications for your vehicle. For more information, visit any Auto Club branch for a free “Be Tire Smart” brochure. This AAA video also provides tire tips.